Fresh seafood prepared the “Shiloh way”. Open for dinner, Thurs-Sat. Award-winning signature BBQ is smoked slow and low over hardwoods until tender and loaded with an amazing flavor. Cooked fresh daily, pit to plate. Menu items include pulled pork, BBQ chicken, beef brisket, fall-off-the-bone St. Louis style ribs and a 50-item fresh fruit and salad bar. Open 7 days a week for lunch and dinner. 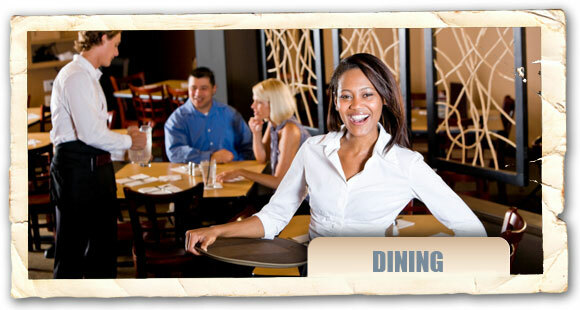 Dine-in take-out, drive-thru and catering services available. Pick from a great chicken salad, the marvelous egg salad, or one of three types of sauces for your barbeque sandwich. Everything is made fresh daily, and sampling is encouraged! Enjoy great food and spirits in an upscale environment in the heart of the downtown. Restaurant and sports bar. Also catering. Coffee shop, bakery, donut shop. Open seven days a week, breakfast and lunch. A family-friendly full-service bar and grill serving up great food, great drinks, and a great atmosphere. Daily lunch and dinner specials, plus happy hour. 20+ flat screen TVs that show all major sporting events including (but not limited to) the NFL, NHL, MLB, NBA, NASCAR, NCAA, & UFC. Downhome cooking and soul food at its best. Open breakfast, lunch and dinner, Tue-Sat; lunch and early dinner on Sundays. Burritos and enchiladas are staples at this casual joint serving classic Mexican & American eats. Open daily for lunch and dinner. Offers great steaks, pasta, ribs, and seafood in the historic old Bank of Chesterfield in the heart of downtown Chesterfield. Featuring nightly specials and a large array of fabulous appetizers. Must trys: the homemade onion rings (mom's old recipe) and the bacon wrapped shrimp! Open Wed-Sat for dinner. Click here to visit on FaceBook. Offers over 150 craft beers from around the globe in a neighborhood atmosphere that feels both relaxed and upscale. Beer experts on staff to answer all questions. Daily specials, live music, and unique events each and every month. Beer and food to appease all appetites. Groups of all sizes welcome. Home-style cooking at its finest. Come early for Sunday lunch to get a seat. Best steak in western York County! Enjoy the originality of this unique setting. Lunch and dinner.